This morning we rose at 4.40 and our first sitting sitting had breakfast at 5am. [ugh] Crewe, Birmingham, Oxford and Reading. 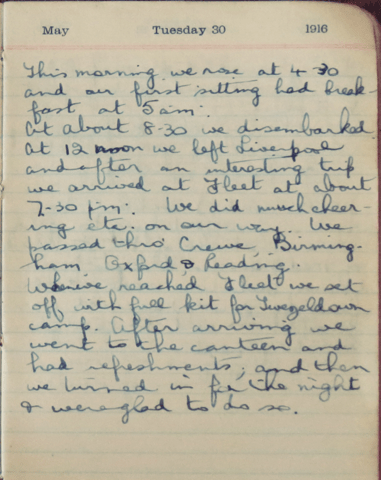 When we reached Fleet we set off with full kit for Twezeldown camp [about three miles]. After arriving we went to the canteen and had refreshments; and then we turned in for the night and were glad to do so. On the morning of May 30th, the Unit disembarked from the “Adriatic” and was soon entrained in those toy English coaches with their ridiculous little engines. The day was glorious and the journey south afforded a feast of beauty. The hedgerows, ablaze with the full-grown Hawthorn; the rich verdure of the pastures and the grandeur of the English woodlands proved a revelation to the Canadian-born. Remarked one lad, “The man who leaves England is a fool, and he who wouldn’t fight for her ought to be shot.” Another man described the country as one huge park. Even to the English-born boy the Motherland on that perfect May day seemed to be abiding under a great blessing; the very home of beauty. The pleasant village of Fleet in Hampshire was reached towards evening and from this place the unit set out for Twezeldown, three miles off. Being the first Canadians to come to the district, the Ambulance men received very warm, if undemonstrative, welcome from the good village folk, while the few Imperial soldiers around were glad to relieve some of their Canadian comrades of their heavy kitbags … Coffee and cake were served out to the tired newcomers and were most acceptable.